I too really hope that we see Goat Man introduced into the "MotU:C" line. He would make an excellent figure and judging from his pic would not require an all new sculpt either. Actually, there was a character who appeared in the beginning of the first episode of NA that strongly resembled Goat Man, just different colors. The boots sure aren't hurting...! That was just a wish-list? BULL-GARBAGE! 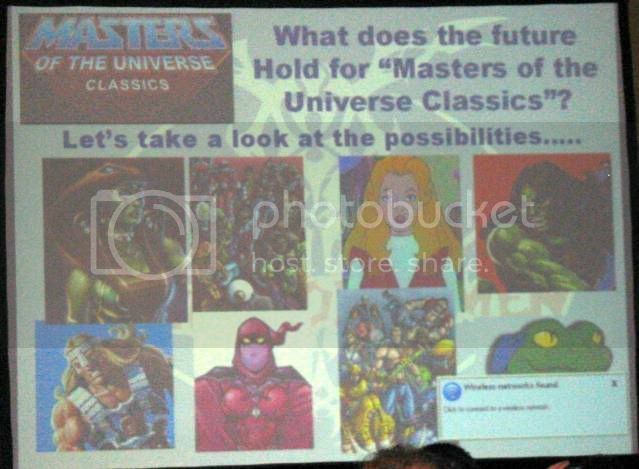 Just like the "mock-up" of what we would soon learn was MOTUC HE-MAN was an idea? There is no way the 4H would have gone ahead and put out that slide without a reason. That would have been unnecessarily cruel.
. . . I am not willing to give up hope that quickly... there HAD to be a reason for that slide other than "We wish...."
Despite the disclaimers, due this presentation by the Four Horsemen and recent board activity by Toyguru, I am inclined to believe that Mattel has reached an agreement with Boomerang Media to produce figures featuring FILMation likenesses if not FILMation-exclusive characters. Working on it -- good chance. Reached agreement already -- unlikely. "Give us Shadow Weaver...so say us all!" Hm... I doubt that any agreement has thus far been reached. I'd think the Horsemen and Toyguru are trying to feel-out fan interest in a way they could then present to the bigwigs in requesting whatever exhorbitant sums are necessary for acquiring the filmation rights. If a figure with a FILMation likeness is revealed at SDCC or in the coming months, then we will have our answer. Agreed, although if none appear at SDCC, I don't think it means some kind of deal isn't in the works. We can ever be hopeful! we are missing only lizard one from here, should this mean a hint for filmation?? All times are GMT -4. The time now is 09:56am.